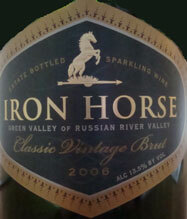 Iron Horse Winery describes their wines as "The drink of optimists" and they make vintage sparkling wines as well as Chardonnays and Pinot Noirs. In fact they produce over two dozen different wines, which are all orderable from their Web Site. They have 160 acres of Chardonnay and Pinot Noir in Green Valley, the "coolest, foggiest part of the Russian River Valley," 13 miles from the Pacific. The soil has excellent drainage and is a sandy clay loam called "Gold Ridge" and balanced with respect to its mineral components. The vines are divided into separate blocks that are treated as different vineyards in terms of farming, harvesting, and vinification. The overall goal is to produce wines that show a "sense of place" or terroir as the French say, specific to not only the Green River Valley but also to the vineyard. These blocks of wine are not designated as either for sparkling or still wines; it varies by the year and depends on the grapes. Winemaker David Munksgard has a very cool blog with some very short and excellent video posts! The sparkling wines do not undergo malolactic fermentation, similar to Krug, Bollinger, Salon, and Lanson (very big names in Champagne). There is extended aging on its lees (the yeast) in the bottle, and even an LD (Late Disgorged) bubbly that spends 7 to 8 years on its lees. They go to a lot of effort to produce a quality bubbly. The critics regular rate their wines in the low 90s out of 100 points. I must agree: although I find them very simple when at refrigerator temperature and when first opened. They rapidly metamorph to more complex and lovely fine drinking critters in my experience. This wine is a monster and could handle a big fat steak, some serious cheese, or some great big seafood! 81% Pinot Noir and 19% Chardonnay, aged 4 years on it's lees. Made Rose by the skin-contact or "saignée" method. This at least in part leads to its intense color. The nose has immediate maritime and plenty of rolling minerals. Some cherry and other red fruits under the minerals. Palate has lots of up front juicy fruit. Cherry, strawberry, and some red plum all wrapped up in minerals. Very big and bold. Slightly bitter, but more in an Islay Whisky way in an off putting way. I love it. 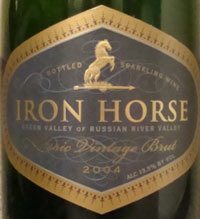 Tasting Note: Iron Horse Classic Vintage Brut 2004 - January 2013, rated A- surprisingly as I'm not a big California guy but this is classy juice! 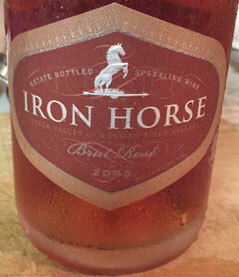 72% Pinot Noir and 28% Chardonnay, aged an average of four years on its lees in the bottle. A medium light yellow with fine bubbles. A nose of apples and apple juice. Way better as it warms as some complexity in the form of minerals emerge. Apple-ly, almost apple juiceish on the palate. A warm creaminess under all the fruit. Certainly elegant. As it warms and breaths a mineral component emerges and it grows and grows as it warms. Oh, I like this, I like this a lot! Drank a couple days after the 2004 above, and much different. More elegant, far less intensity, and very nice as well. The nose is initially lemon, small orange flowers interspersed with a light minerality. Lemon on the palate as well. Nice light to midweight apple and a little orange citrus. Slight creaminess.